As much as I love book reviewing, I get super excited when I have the opportunity to check out something new that doesn't involve books! 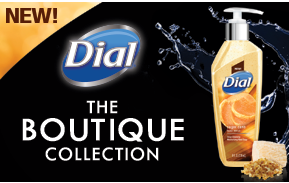 In this case, Purex Insiders sent me some new hand soap from Dial! From the product page : With a creamy sweet scent inspired by fresh cut sugar cane, this premium formula with gentle micro scrubbers cleanses deeply while moisturizing and smoothing skin. My take: After I got over the excitement of having water back to my bathroom sink, I put this right on the counter to try out. Turns out that I love it. Usually the fact that soap smells tend to linger bothers me, but not with this one! The scent is so pleasant (and didn't set my allergies off!) that it wasn't a tough decision at all to decide that this is a soap that I'm going to be picking up more off for future use. It's not just the scent though, after using this soap, my hands felt clean and the skin was soft. I won't go so far as to say that this might be the perfect hand soap, but it is certainly in the running! I received this product in exchange for this review. All thoughts, comments, opinions, and clean hands are my own.